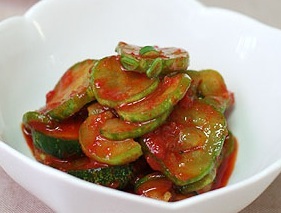 Oi muchim is one of the popular side dish enjoyed by Koreans all year around but especially during the hot summers. Oi means cucumber in Korean and muchim means mixed with seasonings. It's a quick and easy cucumber salad that is simply seasoned with minced garlic, finely chopped onions, sesame oil, sesame seeds and gochugaru (red chili pepper flakes), producing a combination of a spicy, salty, and a hint of sweet taste with a great crunch to each bite. It's a common side dish that is light and refreshing, despite the heat and often served for the entire table to share at many Korean restaurants or at homes. Keep in mind that Asian (Korean) cucumbers are light in color, slender and bumpy with thin skin in comparison to Western cucumbers. Additionally, they are less seedy and very crispy. The type of cucumber used will affect the outcome of this dish and it is recommended to use cucumbers found at Asian/Korean markets.